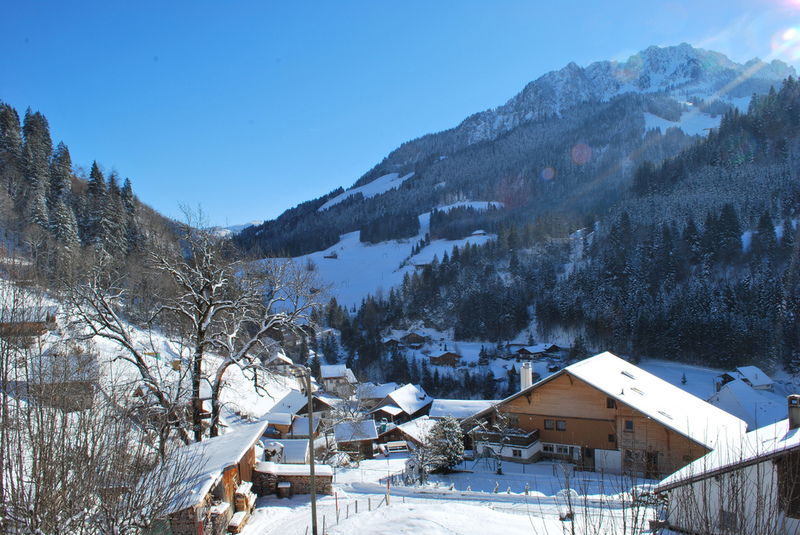 My former boss and friend Mark now lives in Switzerland where he and his family have a chalet in Jaun, the only German-speaking municipality in district of French-speaking Gruyère in the Prealps, or Alpine foothills. Mark generously offered the use of the chalet over Christmas. Tiffany, Sebastian and I took up the offer and planned to go for 4-5 days over Christmas. 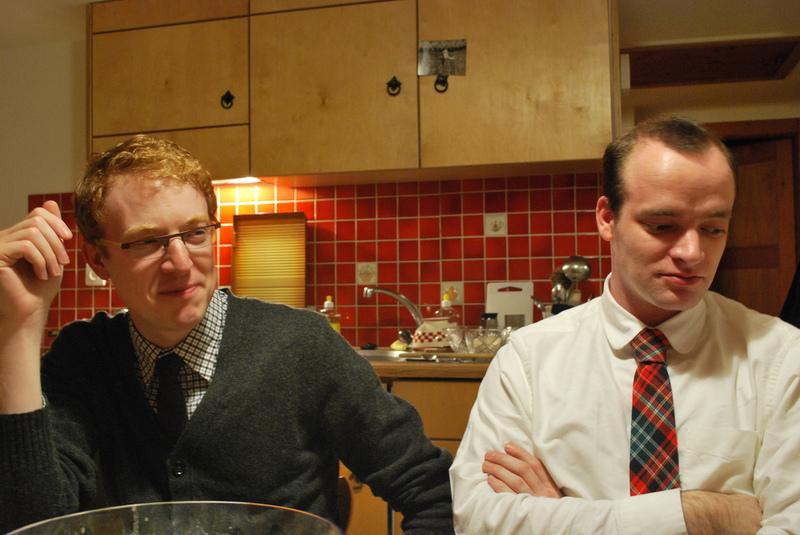 When Peter and Graham, friends from Canada, planned a vacation to Berlin over Christmas and New Year it was decided that they would join us. The Prealps, which is not a made up word. Peter and Graham were to arrive in Berlin, via London, almost a week before Christmas. Winter weather and tonnes of snow caused them to get stuck there. Things looked grim for meeting up for Christmas. Since we would be driving by Basel anyway, Graham eventually managed to arrange a bus to Dover, ferry to Calais, taxi to the train and several trains to Basel where he spent a night. Peter daringly booked a flight from London to Basel for the 23rd. Tiffany, Sebastian and I took the train to Freiburg as planned and picked up our rental car and headed to Basel. After a few wrong turns we arrived in Basel and met Peter and Graham at Graham’s hotel. The universe realigned itself. 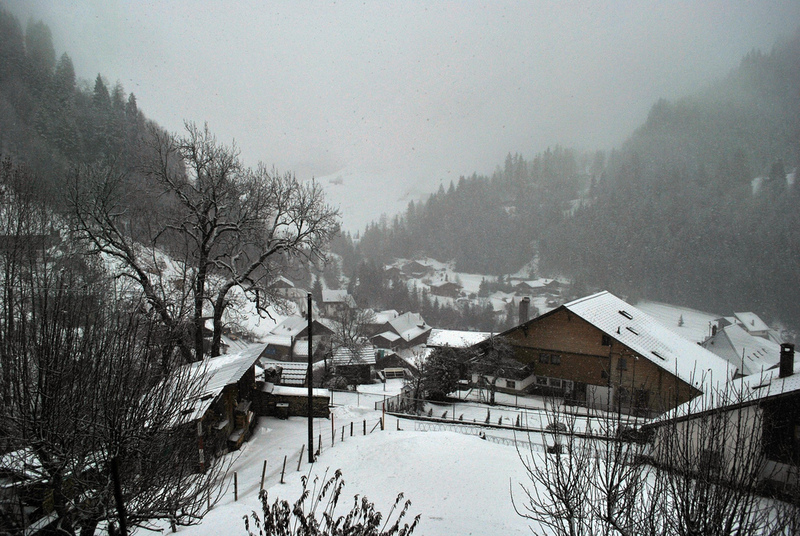 We drove a foggy hour and a half to Jaun where Mark was waiting for us at the chalet. When we arrived, Mark showed us the facilities before heading back home: two bedrooms, living room, kitchen, shower, washing machine, a media player, an unfinished puzzle, snow shoes and skis at our disposal. He mentioned some restaurants in the area and made an offhand comment about the kitchen facilities “if we feel like cooking”. Heh. 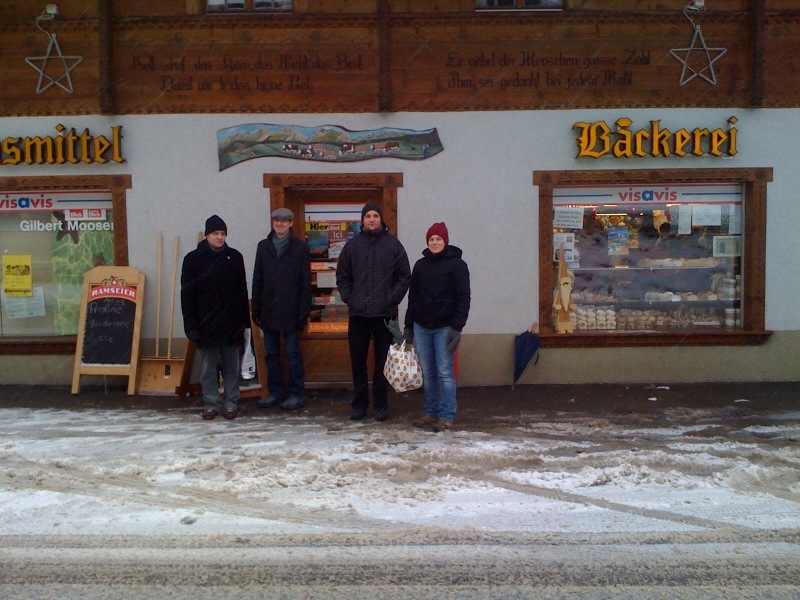 Ravenous, we descended the hill to the local inn where the choice of food was cutlet in a cream sauce or cheese fondue. We unanimously voted for the Rahmschnitzel with noodles and a glass of beer each. The food was good and rustic and in a show of chauvinism the boys were given three pieces of meat and the girls two. On TV the “weekly horoscope read daily” was on. Afterward we tumbled up the hill and into bed exhausted. When we arrived there was barely any snow on the ground. We awoke to snow covered scenery. Prealps! It had started snowing during the night and didn’t stop until the next day. The ski hill is hidden behind the morning fog. Tiffany and I were awake first and with the guys unlikely to be up for another few hours we headed to Coop, a standard Swiss grocery store. Doing groceries in Switzerland is heaven, everything looks amazing, so many meats, pickles, cheeses, quality fruit, yogurts. We were fairly disciplined despite being hungry. 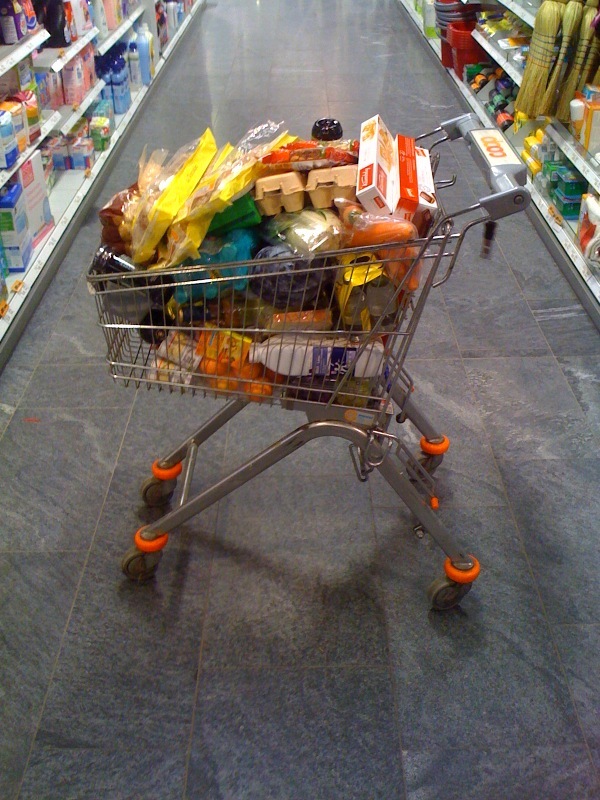 We did manage to fill our (small) cart and forget a few a couple of items. We carried a few items. Although we had initially planned to only shop for breakfast and return later we decided to shop immediately for the next couple of days including Christmas dinner. We stocked up on cookies, chocolate, dried fruit and nuts for snacks. We made several laps of the store deciding on the menu for the next few days. On the way back up the hill to the chalet, Tiffany and I discussed how we didn’t know enough about driving a standard in the snow up a hill. I put it into first and went up the hill without a problem. Several locals out for a walk stepped to the side and waved cheerfully at us. One man gave us an enthusiastic thumbs up. We returned with a breakfast of muesli, fresh fruit, fresh juice and Swiss yogurt with seasonal flavours: plum with cinnamon, chestnut and apple strudel. Coffee beans were provided by Tiffany, who also provided a Hario hand-grinder, a small gorgeous piece of engineering. We also had the chalet’s capsule coffee machine. After breakfast/lunch we went down into the village to the extremely well stocked mom-and-pop shop to purchase the few items that we’d forgotten or hadn’t found. Split-peas, leeks, more loaves of bread. We ventured outside a few times but mostly our enjoyment of the outdoors consisted of admiring the scenery from the window. 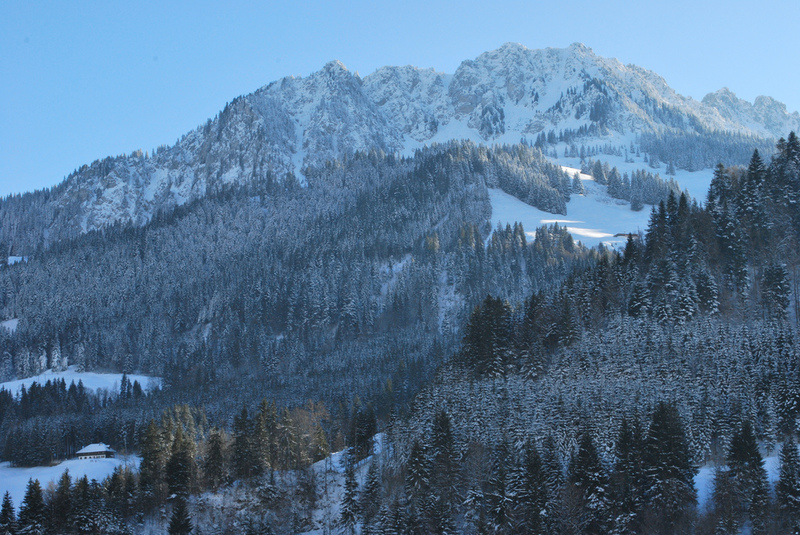 We could even see skiers on the slopes. Skiing would have involved a lot more planning and carrying of stuff. Next time. We had no problem entertaining ourselves with books, cards, our computers, four episodes of Boardwalk Empire and Mark’s backlog of Breaking Bad. Our aperitif, digestif and cocktail of choice for the next four days was gin & tonic. We brought our own knife. 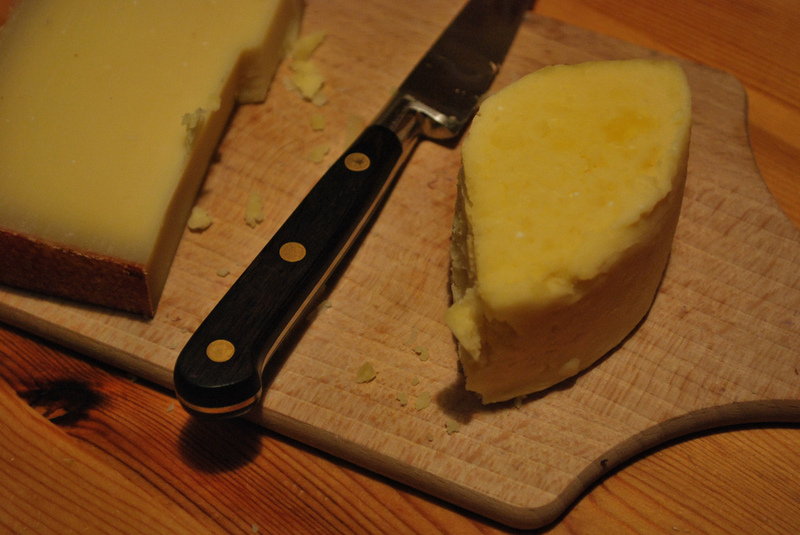 Tiffany had brought a beautiful piece of Cheddar that we left out along with a piece of the local Gruyère. Both cheeses were salty, creamy and delicious. We grazed on it for the next day and a half. If you’ve never eaten your cheese at room temperature, go take your cheese out of the fridge now and try it in an hour. 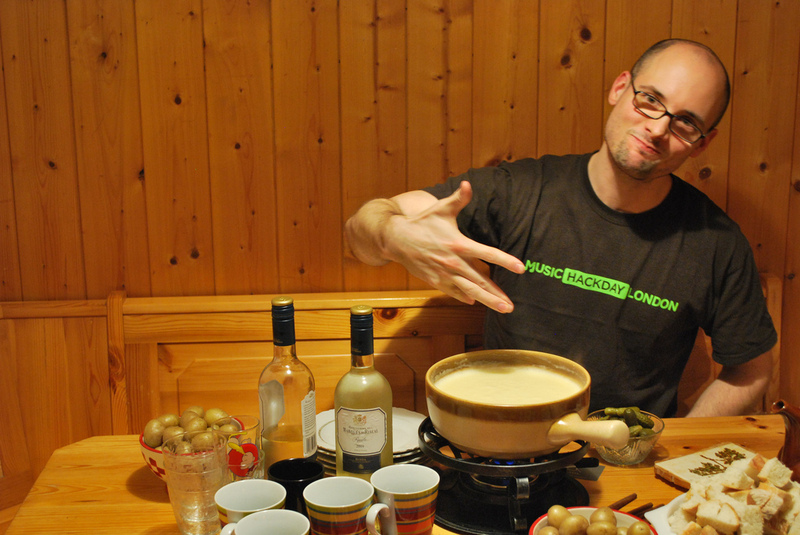 Since Christmas is, after all, about cheeses, we decided that we would have cheese fondue for Christmas Eve supper. At the store there were maybe ten different sorts of fondue available. We picked a package that looked nice and was labelled as feeding four. The chalet, I assume like any good Swiss chalet, came equipped with a proper caquelon and fondue forks. 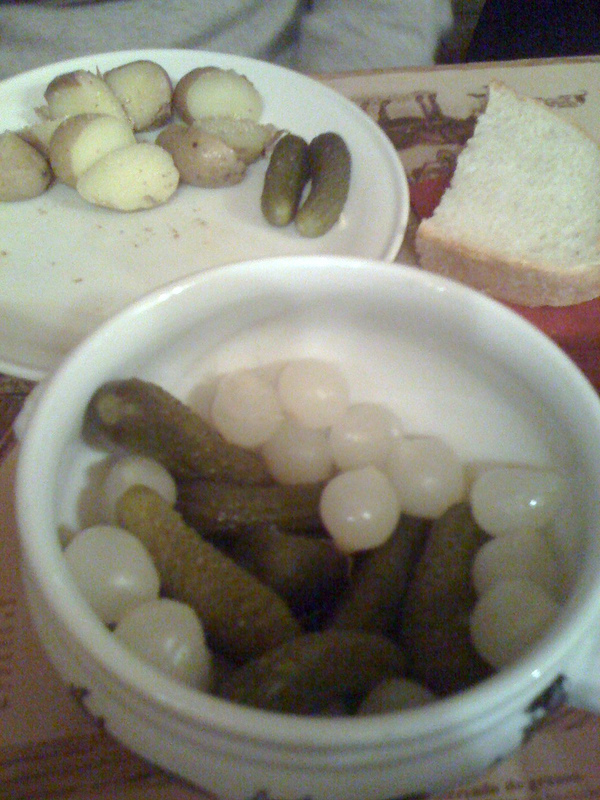 The cheese fondue was served with tasty fresh bread, cornichons and pickled pearl onions, dried meats, raclette potatoes, black tea and white wine. As required we added white wine and, since we had no kirschwasser, gin. Delicious. Afterwards, nearly comatose from the cheese, we went for a walk up the hill. The stars were out and we could look down into the valley, out over the other chalets. Breakfast was an ad-hoc affair, eaten as each person got up. When we were all awake we opened our presents. Sebastian, who had been forced by the Canadian majority to wait until Christmas Day to open presents, received an AeroPress coffee maker from Tiffany. Coffee making turned into a ridiculous half-hour of grinding coffee and attempting to use the “easy & fun” AeroPress while in the background the less patient watched the capsule coffee maker spew water all over the floor and explode a capsule. For lunch, I made a Dutch-style pea soup with split green peas, pork hock and and the non-Dutch cabbage sausage. The soup lasted for four days and was consumed at various times of day. 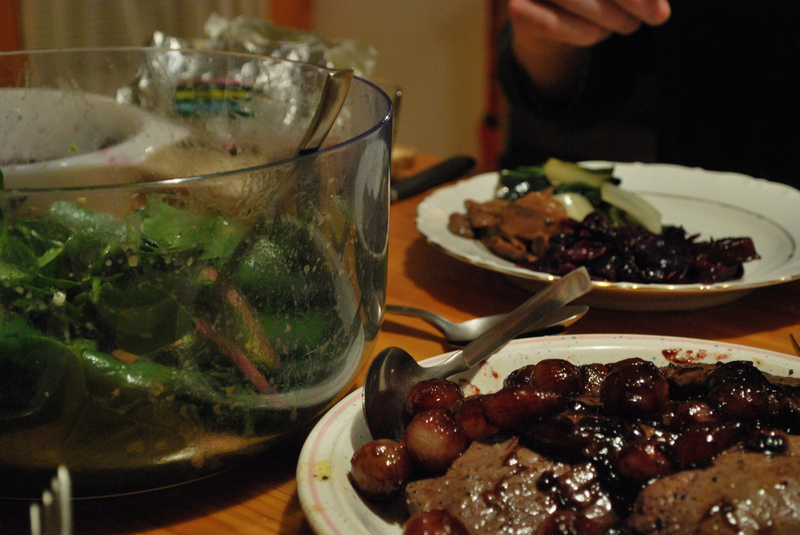 Christmas dinner was a group effort of venison steak with a black currant onion sauce, red cabbage with apples, sautéed swiss chard with garlic, sautéed mushrooms and leftover potatoes in a mustard cream sauce, spinach salad with avocado, red onions and supremely supremed blood oranges. 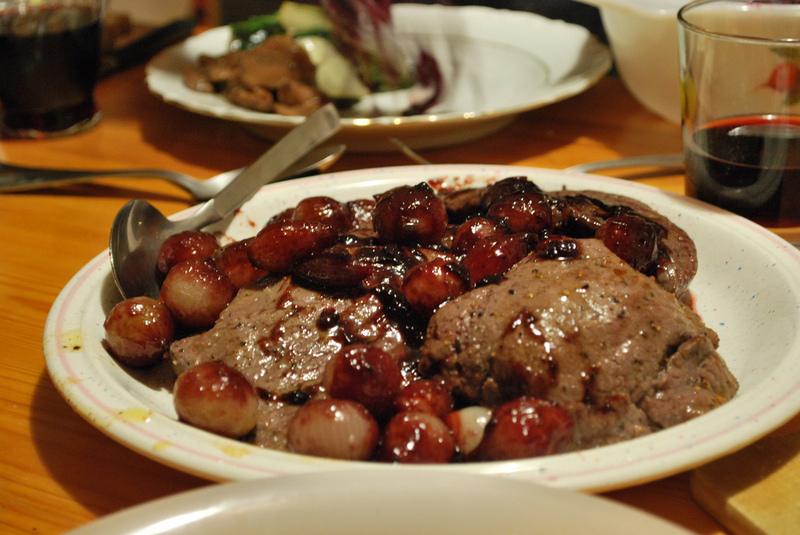 The pièce de résistance was the venison cooked to rare perfection by Tiffany. Dinner was a plaid tie affair. The day after Christmas we had a late breakfast, including pea soup. Peter elected to stay behind while the rest of us went to grab a few things at the store for the dinner Peter promised to make us and take the waters in Charmey, the next town over. The baths included indoor and outdoor pools as well as several saunas. We stood nearly naked in -7°C after a hot sauna and admired the prealpine view. 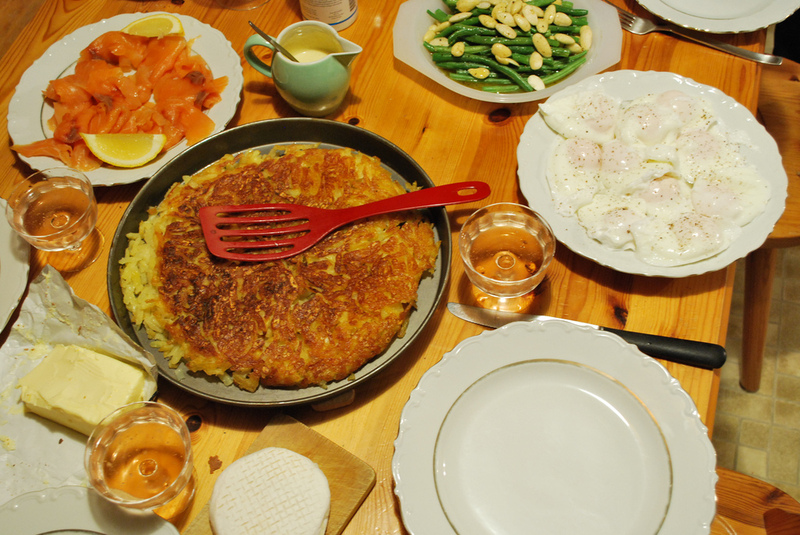 When we returned, relaxed and starving, Peter prepared perfectly poached eggs, rösti, smoked salmon, green beans with blanched almonds and vinaigrette and mustard sauce. The awful rosé almost ruined the meal. The mustard sauce was made by mixing mustard and thick Weight Watchers cream. We had purchased what we thought was half-fat cream, which we later read as full fat cream, which we later correctly noticed to be Weight Watchers cream with “55% less” fat. On the 27th, our last day, we started the day with a light lunch of leftovers turned into a spinach salad with tomatoes, carrots, avocado, onion and boiled eggs with a mustard vinaigrette made from the leftover mustard sauce. In the early evening we made a cheese pilgrimage to the old village and castle at Gruyères especially for raclette. Old town Gruyères is kitschy at best but we went after hours when mostly every one was gone and the trinket stores were closed. Raclette: dried meats, followed by all you can eat cheese, pickles and potatoes and finished with raspberries and a half-pint of crème de Gruyère each. Crème double de Gruyère, which might as well have been butter, also came with the tea we had between the cheese and the dessert. It wasn’t clear to us at first that it was all you can eat. Tiffany’s expression of relief when our pickle bowl was refilled unasked was only slightly less entertaining than the expression on all our faces when asked if we would like more cheese. Peter declined the raclette and had a cold cut planchette and a rösti gruyèriens, rösti with cheese baked on top. After rising early to launder the sheets before leaving we prepared a breakfast that used up almost all our leftovers and the single horse steak we had purchased to share. 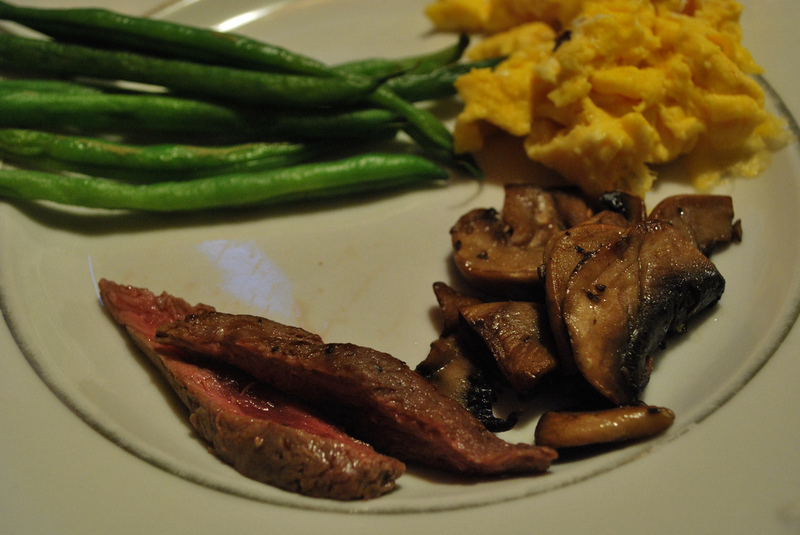 We cobbled together scrambled eggs, one horse steak rare, green beans, and sautéed mushrooms. A delicious end to the Worst Christmas Ever. The journey back was long and boring and involved an uneventful on-time car trip and a very long, very late train ride. More photos to check out in Tiffany’s Christmas in Switzerland set. This trip was ultimately about killing ourselves laughing at our own decadence, which you have captured perfectly. 🙂 Next time we ski and eat tv dinners. Lovely. I almost feel like I was there. Oh, hey, Jessica! Was this you? Raspberries with crème de gruyère and a sprinkling of sugar. Heaven. Does that mean you found crème de gruyère in Austin? I wish. Nope, I’m guessing Kristin. Yeah, was definitely me. I think when I was staying with Mark and Cécile.